What is AOMEI Backupper 4.1.0? 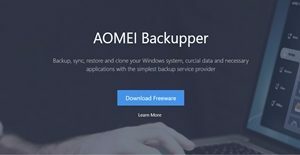 AOMEI Backupper 4.1.0 is a newly revamped and more powerful backup solution for medium-sized businesses. An affordable solution, it offers protection against data loss, as you can back-up an entire server, hard drive, or choose which files and folders to duplicate regularly. As such you can rest assured that your running Windows version as well as your applications are safe. With AOMEI Backupper 4.1.0, your most critical files and documents are backed up every time a modification is done. This real-time synchronization lets you gain a peace of mind, knowing that your important data is filed elsewhere for easy retrieval. AOMEI Backupper 4.1.0 is a one-stop solution for company technicians who want to do a wide variety of backup-related tasks. That is because aside from duplicating data, it can synchronize, recover, and clone information with ease. AOMEI Backupper 4.1.0 is a cost-efficient software. It has a freeware that has a broad range of capabilities while its paid editions have more advanced features and faster backup and synchronizing abilities. So whichever package you choose for your company, you can rest assured that your needs are met at less the cost. With AOMEI Backupper 4.1.0, you never have to worry about data loss gain. The software helps you ensure that important and business-critical information is backed up, synchronized, and cloned in your preferred storage system. This way, whenever you encounter file or folder issues, you can simply draw your previously generated backups and restore them. AOMEI Backupper 4.1.0 is now more navigable for global users. The interface is enhanced with more languages to enable French, Italian, Dutch, and Turkish speakers to utilize the software’s tools comfortably and proficiently. Storage space can be expensive. That is why AOMEI Backupper 4.1.0 affords you the ability to compress your files and folders to save on space. Other than that, the software assists you in protecting sensitive information by allowing you to set passwords for each backup. What Problems Will AOMEI Backupper 4.1.0 Solve? AOMEI Backupper 4.1.0 is better able to understand your needs and wants for the solution. The latest version of the software has a feedback tool that you can easily access from the menu so you can send your concerns to the developers. The application can now support the editing of tasks that do not have existing backup images as well. It has also improved its notifications of failed tasks, the email notification SSL, and optimized the registration for upgrading the Standard Edition. The previous version of AOMEI Backupper had its own set of issues. The latest iteration of the software aims to address though, which is why it contains enhancements to ensure you do not encounter those problems again. A few examples of resolved issues are the Linux empty partition display, garbled characters in the subject field of emails, and error codes 33, 214, and 4161. To enable more users to be adept at navigating the solution, AOMEI Backupper 4.1.0 has additional languages. These are French, Italian, Dutch, and Turkish. If you are interested in AOMEI Backupper 4.1.0 it could also be sensible to investigate other subcategories of Best Backup Software gathered in our base of SaaS software reviews. Each company has different wants and requires a software that can be customized for their size, type of workers and customers, and the specific industry they are in. For these reasons, no system can provide perfect features out-of-the-box. When you try to find a software product, first be sure what you want it for. Read some AOMEI Backupper 4.1.0 reviews and ask yourself do you want basic features or do you want sophisticated features? Are there any industry-specific tools that you are searching for? Get the answers to these queries to assist your search. There are plenty of elements that you need to consider and these include your budget, particular business needs, your organization size, integration requirements etc. Take your time, check out a few free trials, and finally choose the system that offers all that you want to improve your firm efficiency and productivity. How Much Does AOMEI Backupper 4.1.0 Cost? We realize that when you make a decision to buy Backup Software it’s important not only to see how experts evaluate it in their reviews, but also to find out if the real people and companies that buy it are actually satisfied with the product. That’s why we’ve created our behavior-based Customer Satisfaction Algorithm™ that gathers customer reviews, comments and AOMEI Backupper 4.1.0 reviews across a wide range of social media sites. The data is then presented in an easy to digest form showing how many people had positive and negative experience with AOMEI Backupper 4.1.0. With that information at hand you should be equipped to make an informed buying decision that you won’t regret. What are AOMEI Backupper 4.1.0 pricing details? What integrations are available for AOMEI Backupper 4.1.0? If you need more information about AOMEI Backupper 4.1.0 or you simply have a question let us know what you need and we’ll forward your request directly to the vendor.